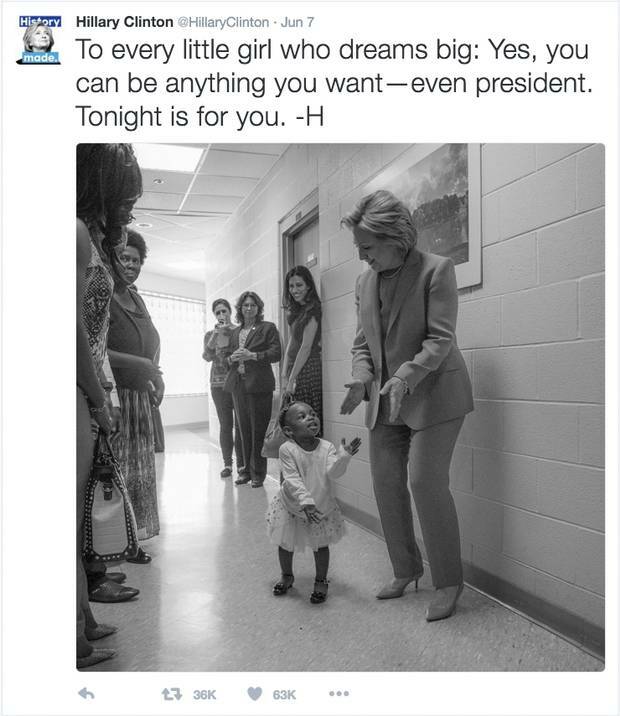 Hillary Clinton tweeted to “every little girl who dreams big” on Tuesday night after becoming the Democratic nominee for president. On Tuesday evening, Maya Carl was sitting with her parents in their living room in San Antonio, Texas. Around her were some favourite toys – a selection of My Little Pony figurines – and on the television, Hillary Clinton was about to claim the status of Democratic nominee for president. The nine-year old was up past her bedtime, a concession by her parents to the historic nature of the occasion. They had tried to teach her that anything was possible but here was that possibility made tangible. She watched intently as Ms. Clinton talked about her own mother, born on the same day that the U.S. Congress gave American women the right to vote. Alan Stewart Carl, her father, found himself moved to tears. "I'm thrilled that at nine years old she gets to experience a moment that some of us didn't know if we'd ever experience," he said. Ms. Clinton came into this presidential primary season the heavy favourite to win her party's nomination and carrying the baggage of a lifetime in politics. Yet earlier this week, she claimed something entirely original, a spot that no woman had ever occupied in American history. Does such symbolism help her campaign? Is she a mediocre candidate or a gifted one, breaking the mold established by her male predecessors? Can she overcome decades of accumulated dislike? For the next five months, these questions will play out in the public arena. But for an evening earlier this week, none of that really mattered. In living rooms across the country, parents kept their kids up late, one generation trying to communicate something to the next: listen, this is something new. As Ms. Clinton declared her status as the presumptive Democratic nominee, some parents saw the event through the lens of a long arc of advances and defeats. Jen Deaderick, 45, watched the speech with her 11-year old daughter Rosie and her 73-year old mother, Ann Butler, in their home in Cambridge, Massachusetts. Watched @HillaryClinton's speech with my Mom and my daughter. That was pretty freaking nice. Back when Ms. Deaderick was a child, her mother would tell her stories about how harassment used to be the norm. Once, during a job interview as a young woman, Ms. Butler was startled when the interviewer patted her on the behind as he showed her around the office. A friend who worked there told her to get used to it. Her mother's career unfolded in environments where men were nearly always in charge, even when more qualified women candidates existed. "Then I grew up and found out that still happens," said Ms. Deaderick. "It's not quite as rampant, but it's still there." On the playground, her daughter Rosie has already heard from some classmates that girls can't like superheroes, or can't play sports – schoolyard gibes that point to the persistence of gendered stereotypes. On Tuesday night, all three generations stayed up late to watch a live feed of Ms. Clinton's speech on Ms. Deaderick's computer. On her wrist, Ms. Deaderick wore a bracelet that she takes out on special occasions. The bracelet once belonged to her mother, who wore it as a symbol of the long fight for a constitutional amendment to guarantee equal rights to women. That effort ultimately failed in 1982. "It was so important to be that they both be there, sitting with me," said Ms. Deaderick. "It connected me to all these generations of women, this kind of awe at what Hillary had accomplished." Some parents marveled at the world their children took for granted. In Portland, Oregon, Reverend Jeremy Lucas watched Ms. Clinton's speech together with his wife and 11-year old daughter. Rev. Lucas, 44, thought back to his childhood in Birmingham, Alabama, where the women who worked tended to be teachers and nurses, never doctors or lawyers or business owners. By contrast, his daughter's "whole experience of who a president is and who a president can be is completely opposite from more than 200 years of our history, which is amazing to think about," said Rev. Lucas. "Hopefully she'll be telling this story one day," he added. "About back when it was really weird when one woman ran for president, but now there are many women running for president."